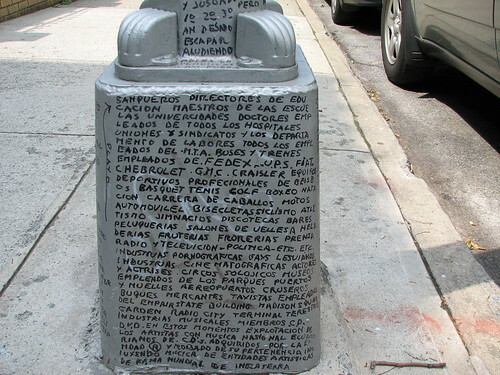 Has anyone else noticed the writing on various street lampposts throughout the neighborhood? I spotted a few of these on various streets in Jackson Heights and was wondering how widespread it is. The person or persons doing the writing must be doing so in the wee hours of the morning because the writing is done in small print using a black marker. With the amount of writing done, I can only imagine that it's a time consuming process. It almost looks like a story written on the lampposts. That said, I haven't taken the time to stop and read what's written. I've been meaning to ask about this on the forum. I've seen them in surrounding neighborhoods as well, including Corona, Woodside, and maybe even Sunnyside. Thats funny, i thought it was just some looney here in Woodside. This guy must spend a lot of time doing this. I've noticed it, too. It looks fascinating, but I've never had time to figure out what it's all about. It would be great if somebody could take some pictures and post them here. Here's an image I took of one a while ago (I thought it might make for a good banner image, but I couldn't figure out a good way to crop it). A couple of more photographs here, if anyone wants to translate (though it would be an incomplete translation, as I did not get the whole thing). That is vandalism, hope whoever has been doing this gets arrested. Best scenario would be that the writer get a shock so they wouldn't do it again. In the ghetto something like this would be accepted but not in solid middle class neighborhoods. I, for one, thank this vandal for making our lampposts somewhat more interesting. I have also seen these written lamp posts for at least two years in Sunny side and Woodside. The person that does it seems to be moving East. I have actually read some of the writing on them and it involves a lot issues that are in the media, from local news to international news with a lot of news from Latin America. Most of the writing seems to wrap around the pole from top to bottom. I don't care if it's illegal. I think it's great! It's true, they do make the place so much more interesting. reminds me of the tile man(?) in manhattan. he got ticketed but eventually he became a treasure. Snickers, why do you have to go tell the teacher every time someone puts gum under the desk? â€¢ â€œA Hell of a Town, part VIâ€: 1, 2, 3, 4, 5, 6, 7, 8, 9, 10, 11.
â€¢ â€œA Hell of a Town, part VIIâ€: 12, 13, 14, 15, 16, 17, 18. Best scenario would be that the writer get a shock so they wouldn't do it again. In the ghetto something like this would be accepted but not in solid middle class neighborhoods. Thank you, snickers, for hitting the nail on the head, particularly your inference about social differences between people in the middle class and those who live in the ghetto. Somehow, you knew exactly what people living in a ghetto would be thinking in their one collective mind. As someone who moved to Queens from the Bronx and some of whose great-grandparents immigrated to the US from ghettos, I can tell you street lamp text is completely acceptable. I think itâ€™s mostly a phenomenon in the ghettos of Poland and Romania, and less so in Lithuania and Ukraine, but that may be just my perception. (It probably follows the same dividing lines between communities that sweetened their gefilte fish and communities that didnâ€™t.) I think my mother even told me her grandmother had mentioned the acceptability of street lamp text. That must be why I was so fascinated by it. So can someone translate it?